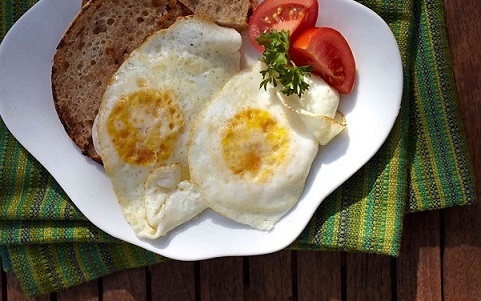 Are Fried Eggs Good for You? When you're looking for a quick meal or snack, eating an egg can always hit the spot. We use eggs every day for things like popovers, breads, cookies, and cakes. We also eat them alone cooked up by frying in a pan. There are also other ways to eat eggs that may be healthier, but why give up your favorite fried egg? This article will help explain healthy ways to eat eggs and if you can go ahead and enjoy them fried. Fried eggs are absolutely good for you if you use the right things to cook them. Of course, cooking a fried egg in bacon grease or heavy oils will make them less good for you. If you use a healthy alternative like olive oil, sunflower oil, or canola oil then you improve their benefits. What If You Have High Cholesterol? In the past doctors would discourage eating egg yolks if you had high cholesterol. Eggs do have around 168 mg cholesterol and about 62 percent of our daily allowance. Recent studies show that eggs aren't actually bad for your cholesterol. The studies showed that when you eat cholesterol, less is produced by the liver and cholesterol actually doesn't go up. We actually need cholesterol in our body to perform vital functions. It exists in every one of our cells. It helps to make the reproductive hormones estrogen, and the stress hormone cortisol. We can't even survive without cholesterol in our body. Because of this, our body produces its own cholesterol as it is needed. This way the body gets what it needs in times of starvation. When you don't eat enough cholesterol containing foods, your liver takes over and produces it. So are fried eggs good for you if you have high cholesterol? The answer is YES! If you include plenty of food containing cholesterol, your liver produces less of it and the cholesterol levels in the body stays in balance. If you lower your intake of cholesterol foods like eggs, the liver kicks in and actually has the ability to make very large amounts of cholesterol, which is unhealthy. Fried eggs and any kind of eggs can help us keep your cholesterol levels in a healthy range, without sending it too high. This is the opposite of previous thoughts on eggs. However, if you have a medical condition that is affected by cholesterol levels, you should still consult your physician on an acceptable amount or limit on egg intake. For healthy people, the recommended amount is to consume 3 eggs or less daily. When you fry your egg in a heavy fat like bacon grease, butter, or margarine you raise the fat level and it becomes unhealthy. 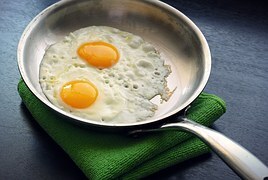 Try frying your eggs in a low-fat oil like olive oil, cooking spray, or even a tiny bit of water. Some non-stick pans are great for egg frying, just make sure they are coated. Fry them until they are fully cooked and the yolk is set to prevent any foodborne illness. You can also lower the calorie count of fried eggs by skipping butter on your toast and including fresh fruits with your breakfast. Try not to top them with cheese or hollandaise sauce to further cut the calories. When you hard boil an egg in water there is no added cholesterol or fat. If you eat a plain hard boiled egg there is 186 mg cholesterol and 5.3 grams of fat. You can actually do more with hard boiled eggs since you aren't cooking them in fat. Throw them in your tuna salad to make a sandwich, mash them on toast with salt and pepper, or make egg salad or even deviled eggs. 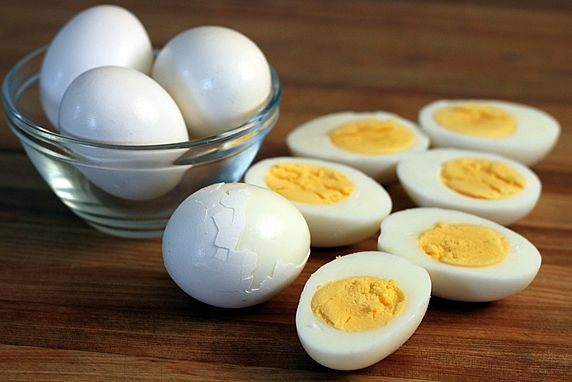 Hard boiled eggs are easily kept in the fridge, so you can boil up enough for a few days. They pack well for lunches or snack on the go. Eggs can be eaten at any time of day: breakfast, snacks, lunch, and dinner. They pair well with just about any other foods. You can fry them, boil them, bake them, or scramble them. Eggs have a variety of proteins, fats, and vitamins that your body needs. These nutrients include vitamin B2, vitamin A, vitamin B2, selenium, calcium, potassium, iron, manganese, vitamin E, folate and zinc. Surprisingly, eggs only have 77 calories, some carbohydrates, 6 grams of protein, and only 5 grams of fat. In order to get the full effects of an egg's nutrition you need to eat the yolk. The egg white is pure protein. Eggs contain the antioxidants lutein and zeaxanthin that can reduce eye diseases like cataracts and macular degeneration. In studies, eggs were found to make you feel full faster and can actually be good on a diet plan for weight loss. Eggs can be good for your brain due to high amounts of choline. Researchers have found that over 90 percent of Americans have a diet that is too low in choline. Eggs are a good source of protein in the diet and can help athletes or people who need muscle strength. They also help to build bones. Go ahead and enjoy your fried egg for breakfast, lunch, or even dinner. With proper cooking fat, fried eggs can be good for you and even help raise healthy cholesterol levels and stop the body's production of bad cholesterol. What Is the Relation Between Eggs and Cholesterol?